In collaboration with several US mayors and governors, Pareto Energy has developed a microgrid organizational, governance and financing framework known as the Energy Improvement District (“EID”). The EID provides communities legal guidance for integrating community energy systems with the utility grid in order to maximize returns, drive efficiency and increase community reliability. The graphic above illustrates an EID that combines community energy assets with customer-owned assets to create an integrated community energy system. 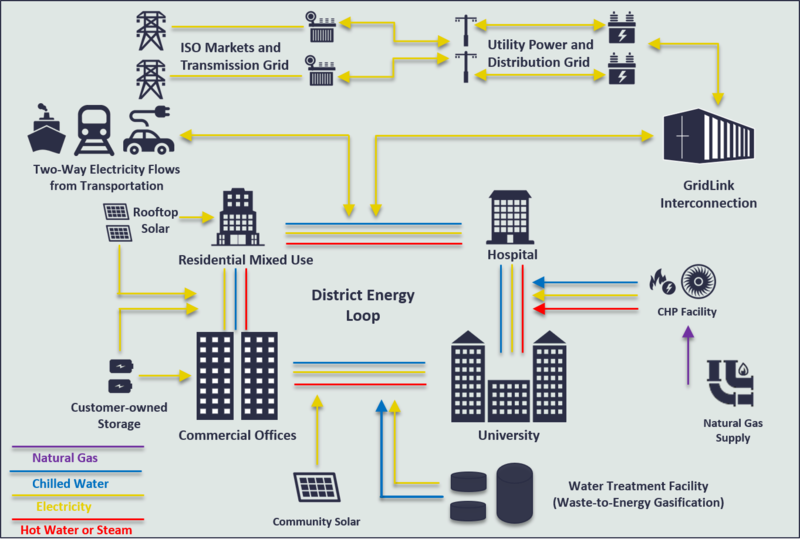 In this example EID, users determined that the creation of a district energy loop was the most effective and efficient method of integrating the available energy assets. Moreover, diversity of load profiles among the EID participants enabled a higher utilization of the existing energy assets, thereby increasing their efficiency and lowering costs for all users. Finally, due the architecture of the energy system with the GridLink interconnection platform, the entire EID can aggregate its generation assets to sell into wholesale energy markets. This aggregation has the potential to significantly increase the earnings to both the EID and its individual users. Based a set of design principles drawn from Elinor Ostrom’s Nobel Prize Winning research, the EID utilizes proven institutional arrangements where consumers have collectively managed electric power generation and distribution as an infrastructural commons to improve the economic efficiency and environmental performance of their energy use. The EID provides a powerful coalition to overcome the market power of monopoly utility distribution companies, including unfair tariffs for stand-by power and lengthy and expensive interconnection approval processes. A core component of the EID is its legal authority to act as a municipal corporation. In many jurisdictions, municipal corporations are entitled to numerous benefits, including the ability to issue tax-free bonds to finance microgrid infrastructure, the right to aggregate energy needs between multiple users and the prerogative to supplant and/or supplement a utility franchise. EIDs enable the aggregation of community assets and energy demands into a single, controllable energy system. Doing so allows users with diverse load profiles to better balance their energy demands and maximize the overall efficiency of the community energy system from both a cost and sustainability perspective.